A blend of sports bike and tourer, sports tourer motorcycles combine certain traits of each category providing all the performance of a Sports Bike with all of the comfort of a tourer; and allowing for longer distance riding at higher speeds. Larger fairings than would normally be found on a sports bike, which help to reduce overall fuel consumption. 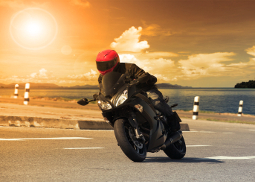 An adjustable windscreen provides better protection for the rider against the elements. A specially designed frame encourages a more upright riding position and provides comfort that will last the whole day through. A longer wheelbase and relaxed steering angle gives a more straight-line stability, but not as much as a full tourer. This provides a much slicker ride over rough surfaces. A larger capacity fuel tank is incorporated to give long range distances between fuel stops. One of the key differences between a sports bike and sports tourer is the addition of panniers. Whilst these are not as large as you would typically find on a full tourer, they provide storage space for any essential items the rider may need. With a middleweight classification, the sports tourer still remains much lighter and more agile than a full tourer.